The EHF Arbitration Tribunal made a decision regarding the incident involving Mr. Zoran Georgiev, HC Metalurg representative. 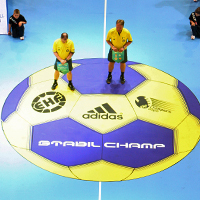 Due to an inappropriate conduct during the match between FC Porto Vitalis (POR) and HC Metalurg (MKD) in Porto on 4 September 2010 at the VELUX EHF Champions League qualification tournament, which led to a short interruption of the match, disciplinary proceedings were initiated against Mr. Zoran Georgiev, HC Metalurg representative. Mr. Zoran Georgiev is suspended from the participation in international handball competitions for three months and shall pay a fine of 750 Euros.